Visit us on Facebook for the latest news about the project. 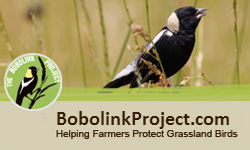 Let others know about The Bobolink Project. The Bobolink Project began as a research study developed by researchers at the University of Rhode Island, the University of Connecticut, and the University of Vermont. While initially designed to investigate conservation-minded donor behavior, The Bobolink Project proved to also be extremely valuable to grassland bird conservation. The Bobolink Project essentially creates a "market" for grassland birds and the ecosystem services they provide. When the research study came to a close, two New England conservation organizations, Mass Audubon, and Audubon Vermont jumped at the chance to take over The Bobolink Project to ensure that grassland birds could still benefit from this process. New Hampshire Audubon joined the team in 2017. The Bobolink Project is administered by Mass Audubon, Audubon Vermont, and New Hampshire Audubon. Mass Audubon protects 36,500 acres of land throughout Massachusetts, saving birds and other wildlife, and making nature accessible to all. As Massachusetts' largest nature conservation nonprofit, we welcome more than a half million visitors a year to our wildlife sanctuaries and 20 nature centers. From inspiring hilltop views to breathtaking coastal landscapes, serene woods, and working farms, we believe in protecting our state's natural treasures for wildlife and for all people - a vision shared in 1896 by our founders, two extraordinary Boston women. Today, Mass Audubon is a nationally recognized environmental education leader, offering thousands of camp, school, and adult programs that get over 225,000 kids and adults outdoors every year. With more than 125,000 members and supporters, we advocate on Beacon Hill and beyond, and conduct conservation research to preserve the natural heritage of our beautiful state for today's and future generations. We welcome you to explore a nearby sanctuary, find inspiration, and get involved. Learn how at massaudubon.org. Audubon Vermont, a state program of the National Audubon Society, has had a grassroots presence in Vermont since the founding of "The Audubon Society of Vermont" in 1901, and has grown to over 4,000 members with 7 volunteer chapters throughout the state. Audubon protects birds and the places they need, today and tomorrow. Through the active engagement of volunteers at the grassroots level, Audubon Vermont has played an important role in securing key environmental protection in Vermont. Programs like the Champlain Valley and Forest Bird initiatives and the Green Mountain Audubon Center are at the center of these efforts. In a state that supports many environmental organizations, Audubon Vermont is unique in its multidisciplinary approach with site-based environmental education and a strong grassroots chapter network at its core. New Hampshire Audubon's mission is to protect New Hampshire's natural environment for wildlife and people. Founded in 1914 to protect and restore migratory bird populations, NHA has built on that mission using science-based conservation, environmental advocacy, land protection, and education to protect wildlife and their habitats. Our conservation and education work ensures that New Hampshire's valuable ecosystems are respected and preserved to sustain wildlife and people. Our environmental education programs and events reach over 22,000 children and adults each year and our 39 nature sanctuaries protect 7,500 acres of forest, meadow and wetland habitats for wildlife and people to enjoy.